Growing up in Florida I learned from a young age the importance of aloe. As a teenager I realized that aloe helped to quickly clear up breakouts and other teenager skin issues. In my 20’s and early 30’s I discovered that I have sensitive skin and that my face didn’t just have freckles, but laugh lines and the beginnings of sunspots too… As I progressed through my 20’s into my 30’s, I tried every product I could find on my face and nothing worked. Most products clogged my pores causing my face to breakout or it was too oily or too drying and many were very expensive with no results. One summer about 10 years ago I discovered a product that changed my life. 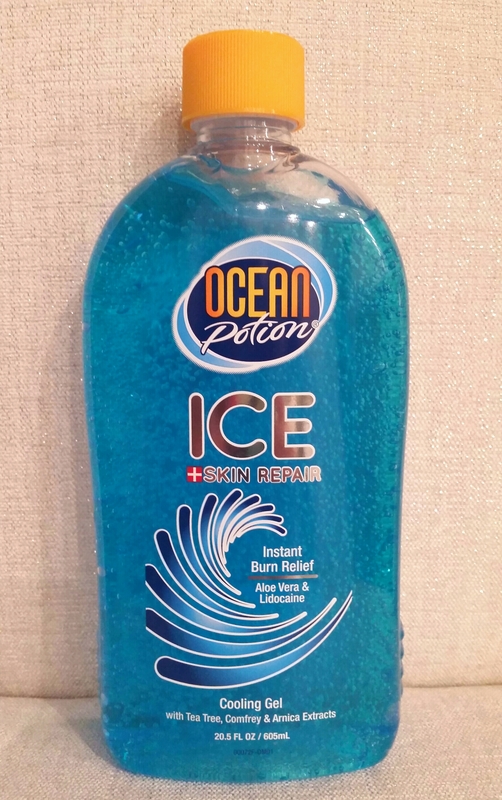 I was shopping for aloe after a day at the beach and came across Ocean Potion ICE. This isn’t just any aloe product. ICE is enriched with natural extracts of Arnica Flower, Comfrey, Aloe Leaf, Tea Tree Oil, Menthol and Lidocaine and provides temporary pain relief from sunburn, scrapes, windburns, minor burns, insect bites and so on. Every day for the last 10 years I apply ICE to my face when I get out of the shower each morning and again when I wash my face at night before going to bed. This product has worked wonders for my face and skin. It works for razor bumps, and makes my legs super smooth after shaving. I love the cooling menthol and the aloe clears up my skin. If you have a teenager it helps acne and the cuts and scrapes lil kids often get. I have a friend who rubs her kids feet with it before they go to bed at night and another whose husband is a landscaper and loves it. He uses it for bug bites and also on his face after shaving. You can find Ocean Potion ICE at your local Walmart or online at http://www.oceanpotion.com. I’ve tried other aloe products by Ocean Potion and by other makers and none give the same results as ICE. If you have sensitive skin or problem skin, if you work outside, play outside, camp or go to the beach, if you shave, have cuts or bug bites or if you just simply have a sunburn; ICE is for you! I’ve used ICE daily for over 10 years and swear by it!! !